A team of architecture and engineering students have devised a way to harness Egypt’s strong solar rays and combine them with an innovative design. 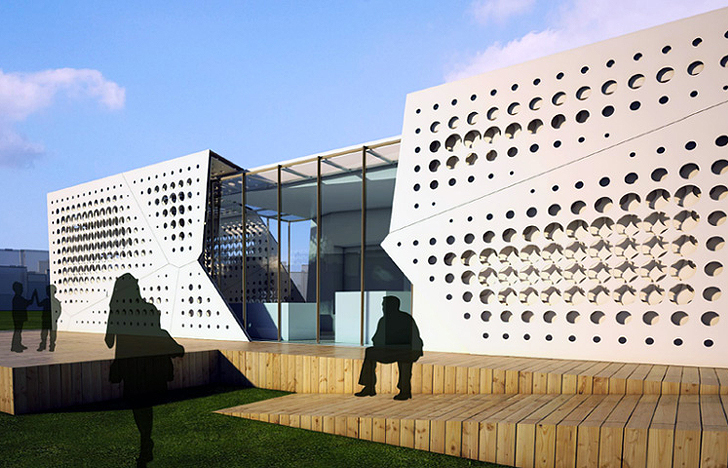 The SLIDES house -- which stands for sustainable, livable and interactive design -- is the American University in Cairo’s entry for 2012’s European Solar Decathlon. The home is designed to maximize solar power efficiency and sustainability. Since Egypt is a country known for not only its hot sun, but its architectural tradition, the students wanted to design a modernized home that echoed the past. The students compare the structural design to a matchbox, with a double layered façade of interlocking perforated pieces, cast in a sand hue with yellow infusions. The latticework perforations are an Arabic architectural trait, but also work to control solar gain and create shade. The panels can slide to adjust the levels of sun that is let into the house, and they also echo the interlocking stones of Ancient Egyptian construction. Each side of the house can be slid out, allowing the inner matchbox structure to emerge. When closed, the home maintains a passive cooling system. Since temperatures reach well into the 100s in summer months in Cairo, a ceiling vent helps hot air escape. In winter, the second screen of the building’s skin is opened to absorb heat that is stored in thermal mass flooring. SLIDES is entirely powered by the sun, with a roof clad in solar thermal panels and photovoltaic cells. Combined, it becomes a net-zero energy structure, providing enough power to maintain a much needed cooling system for the desert area. Water shortage is also common to the area, so a grey water filter recycles water for drop irrigation and toilets. Amazingly, the students even developed a recycled material that the building is constructed of. Plastic bags and wood waste are mixed together to create a fiber reinforced polymer that is molded into the perforated screens. Should SLIDES be approved at next June’s Solar Decathlon Europe, it will cost a cool $1.1 Million to bring the home into fruition. Since Egypt is a country known for not only its hot sun, but its long tradition of architecture, the students wanted to design a modernized home that echoed architecture traditions of the past. 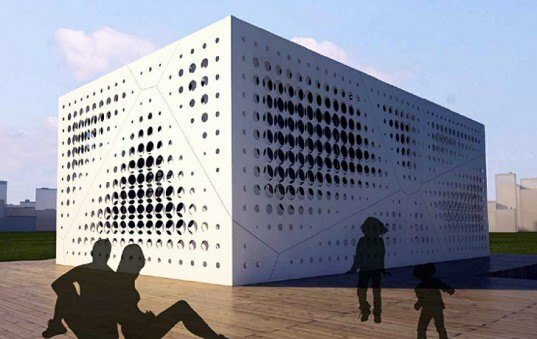 The students compare the structural design to a matchbox, with a double-layered façade of interlocking perforated pieces, cast in a sand hue with yellow infusions. The latticework perforations are an Arabic architectural trait, but also work to control solar gain and create shade. The panels can slide to adjust the levels of sun that is let into the house, and also echo the interlocking stones of Ancient Egyptian construction. Each side of the house can be slid out, allowing the inner matchbox structure to emerge. When closed, the home maintains a passive cooling system. Since temperatures reach well into the 100s in summer months in Cairo, a ceiling vent helps hot air escape. In winter, the second screen of the building’s skin is opened to absorb heat, which is stored in thermal mass flooring. SLIDES is entirely powered by the sun, with a roof clad in solar thermal panels and photovoltaic cells. Combined, it becomes a net-zero energy structure, providing enough power to maintain a much needed cooling system for the desert area. Water shortage is also common to the area, so a grey water filter recycles water for drop irrigation and toilets. Amazingly, the students even developed a recycled material that the building has been constructed of. Plastic bags and wood waste are mixed together to create a fiber reinforced polymer that is molded into the perforated screens. Should SLIDES be approved at next June’s Solar Decathlon Europe, it will cost a cool $1.1 Million to bring the home into fruition.